The Nashville Predators arrived at the playoffs obviously ready to play, dispatching the Chicago Blackhawks in a 4-0 sweep. At the end of the regular season, the Predators had 94 points with a record of 41-29-12. Nashville has momentum coming out of the series versus Chicago and is looking to continue their dominating playstyle. 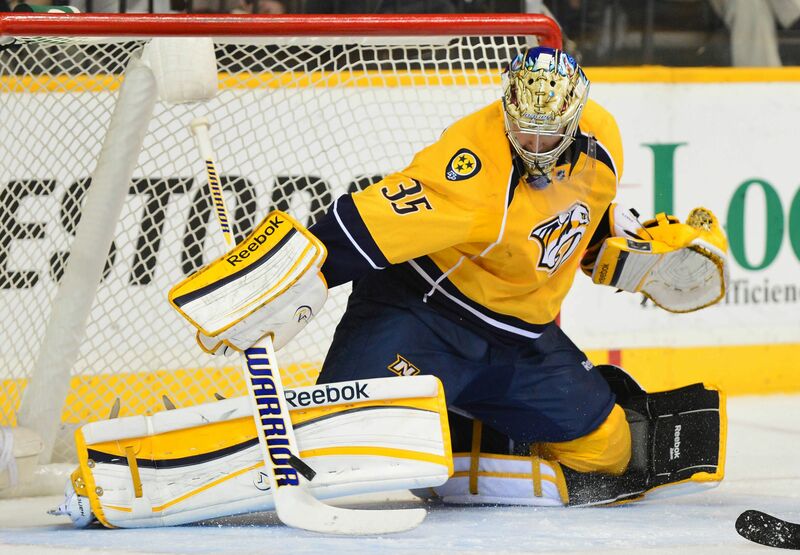 Pekka Rinne has played outstanding in the opening series with only 3 goals allowed in 126 shots by the Blackhawks. Another key to the Predator’s success is the ability for their defense to step up and get on the goal sheet. Roman Josi and Ryan Ellis tallied a collective total of 3 goals and 4 assists so far, with the total defensive stats tallying up to 7 assists. Nashville scored a total of 13 times in 4 games. St. Louis has been very competitive in recent years, and although not making past the Western Conference Semi-Finals, they have showed their skill and grit with the elimination of the Blackhawks in 2016 and now the Minnesota Wild in 2017. Key players for the Blues as far as production and scoring go are Vladimir Tarasenko, Alexander Steen, and Jaden Schwartz. Tarasenko is known for his speed, agility, and skill with his hands and has been known to come up big when needed. Jake Allen has also been playing very well as of late, tallying up a .956 save percentage over the course of 5 games versus the Wild. Although this is not the popular opinion, my prediction is that Nashville will defeat the Blues in this series. They have the momentum after defeating the top-ranked team in the Conference and have an edge in the goalie department with Rinne. When facing the Blackhawks, the Predators were able to shut down major players like Jonathan Toews and Patrick Kane very well, and I believe that they have the capability to do the same against the Blues. I do not think it will be a pushover series or a blowout of any kind, likely going to game 6 or even 7. This is going to be an exciting series that I am looking forward to watch. Predators in 7. The Ducks finished the regular season in the number one spot in the Pacific Division with a total of 105 points, placing them 3rd in the Western Conference. In this series, a key Ducks player to watch out for is Ryan Getzlaf. Getzlaf currently has 7 points in 5 games with 4 goals and 3 assists. With this being said, the matchup that people are looking at being a key factor is Anaheim’s Kesler, known for being an excellent two-way forward, and Edmonton’s McDavid, who led the league in points this year. The player from the Ducks that I am looking at to produce goals is Rickard Rakell, who led the team in goals this season with 33, 10 more than the next player on the list. Rakell has begun finding his niche with Anaheim and his production has drastically increased in the past few years. The Edmonton Oilers have finally returned to the Stanley Cup Playoffs since being defeated in the Finals in the 2005-2006 season. Led by young captain Connor McDavid, the Oilers have put up an impressive 103 points this season to put them 4th in the Western Conference. Speaking of Connor McDavid, he is the player to watch this year, tallying 100 points this season (Selke winner), with production all but slowing. So far in this year’s playoffs, McDavid has 2 goals and 3 assists in 7 games. However, McDavid is not the only Oiler that is producing, as there are 5 other players who have 2 or more goals in their first 7 games. One thing that I noticed was that out of those 6 players who have multiple goals, two of them are defensemen. This shows the ability for their defensemen to step up and help out on the goal sheet. 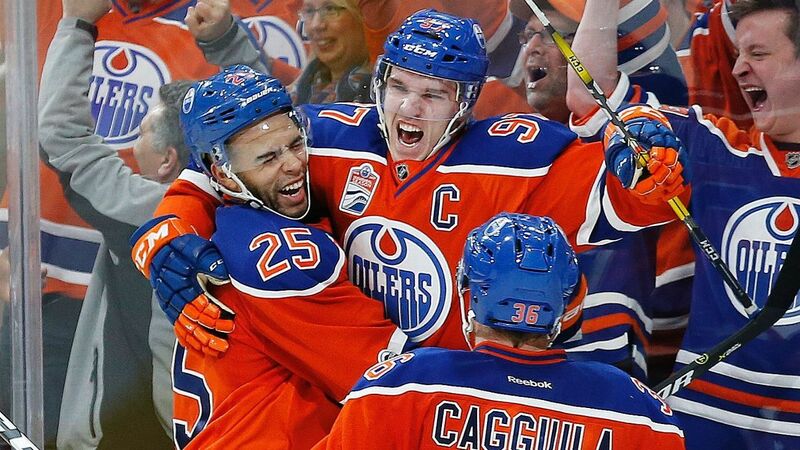 My prediction is that the Edmonton Oilers will dispatch the Anaheim Ducks in this series. After missing the playoffs for the last 10 years, I think the Oilers have a hunger to achieve. Also, looking at sheer production statistics, I think the Oilers have the capability to out-perform the Ducks on the score sheet. That being said, Anaheim has consistently done well in the playoffs in the past few seasons, and I expect the intensity to be similar to what I have seen from them. In addition, should it come down to a goalie battle, I personally think that Anaheim’s John Gibson can out-perform Edmonton’s Cam Talbot, although their stats are fairly similar. Oilers in 6. Trevor Peterson covers the NHL for The Sports Guys.